Andrew is the driving force behind our commitment to culinary excellence and has been the Executive Chef at Chapter One since March 2000. As well as creating inventive menus that harmoniously blend fresh, seasonal ingredients in sensational dishes, he also leads and inspires a team of talented kitchen staff who share his passion for the art of cooking. Andrew began his career working with the renowned chef Nico Ladenis at Chez Nico in London's Park Lane. He honed his management and private function skills at London's premier five-star hotel, The Ritz. Prior to being head-hunted for Chapter One, Andrew was Head Chef of the Dining Room at The Landmark in London, one of the capital's most prestigious hotels. Chef patron, Andy McLeish regularly features within Great British Chefs and highlights many of his fabulous recipes as well as video demonstrations, culinary stories and profiles. These are shared amongst other leading chefs and followed by avid foodies. Stay up to date with all of Andy's articles with the link below. Find out more. 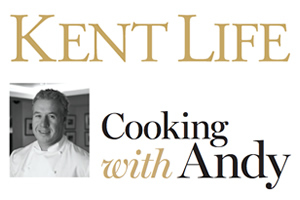 Don't miss our Chef Patron, Andy McLeish's column in local glossy magazine, KENT LIFE. In his column Andy will share his passion for Kentish produce, as well as cooking tips and simple recipes for you to try at home.